This Hanyu comes from the independent bottler Nectar of the Daily Drams and is aged from 1991 to 2010 in a cask with Japanese red oak heads. Red oak (Quercus acuta) is a type of oak native to Japan/Asia. To quote Wikipedia: Due to its foliage and habitat, it looks very unlike an oak. 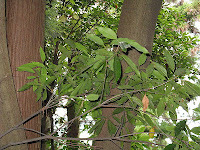 It is usually bushy and densely domed, reaching a height of 14 m. The bark is smooth and dark grey. Leaves are dark and glossy above and yellowish beneath. They narrow to a long, finely-rounded tip. The flowers are on a stiff 5 cm catkin. Bottled at 56% vol. cask strength. Comment: Very oaky, but it works very well! No tanins or other negatives but lovely well integrated oak aromas (which are fairly typical for Hanyu in my opinion). A tad expensive maybe.